After a volatile end to 2018, interest rates continued their move lower in the first quarter driven by a dramatic shift in U.S. Federal Reserve policy and overarching concerns around the health of the global economy. The benchmark ten-year U.S. Treasury, which hit a recent high of 3.23% last November, began the year at 2.69%, and finished the quarter down almost 30 basis points at 2.41%. 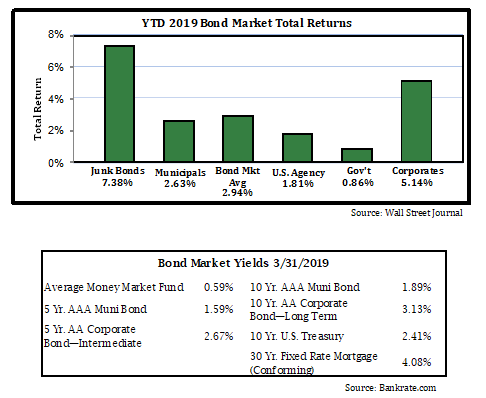 Catalyzed by the synchronized shift lower in interest rates, every major fixed income sector has seen positive performance so far this year. This is in stark contrast to 2018 where corporate, high yield, and emerging market bonds all recorded negative returns. One of the most significant developments in the first quarter was the U.S. Federal Reserves’ shift in monetary policy. With the Fed’s role as the central bank to the largest economy in the world, many countries take their economic and monetary policy cues from it. At its’ December 2018 meeting, the Fed felt confident enough in the health of the U.S. economy to raise interest rates to 2.25%-2.50% despite vocal pushback from many, including the President. Concerns around the potential impact on the U.S. economy were compounded by ongoing weakness in European and Chinese economies. At the most recent meeting in March, it became clear that the Fed shared some of these concerns as they dropped their forecasts for 2019 U.S. economic growth and lowered their anticipated rate hikes from two projected rate increases (for calendar 2019) to zero. This is a dramatic reversal from an organization that typically moves at a measured pace and while not entirely surprising to the market, it has resulted in rates drifting lower in most major markets throughout the world. With monetary policy shifting from a headwind to a potential tailwind, we expect to see less pressure on fixed income assets in 2019. While the Fed has made no guarantee that we have seen an end to rate hikes, they have made it quite clear that it would take a material improvement in U.S. (and global) economic data to warrant additional increases. Additionally, in the event that we see interest rate cuts at some point in 2019, it would likely happen in an environment of worsening economic data which has historically resulted in meaningful increases in bond prices. Our base case assumption at Osborne Partners is that there will be no further interest rate hikes during 2019, but we also do not predict any rate cuts either. In this environment we prefer to hold shorter maturity bonds (2-6 years) and focus on high quality issuers. High quality municipal bonds continue to offer compelling tax-equivalent yields for individuals in higher tax brackets and our position in floating rate loans offers higher income while shielding investors from unexpected increases in interest rates. We look forward to updating you on any changes to our thinking as the year progresses.